Over coming weeks I shall be introducing you to all the Columbia Road Market traders I have been buying plants and flowers from over the past year. No matter how early I get to the market – whatever the season or the weather – herbsellers Mick & Sylvia Grover are always already set up, possessing resilient smiles and ready for business at the corner of Ezra St and Columbia Rd, where they sell the enormous variety of sweet-smelling and useful plants which they grow themselves in Hainault. 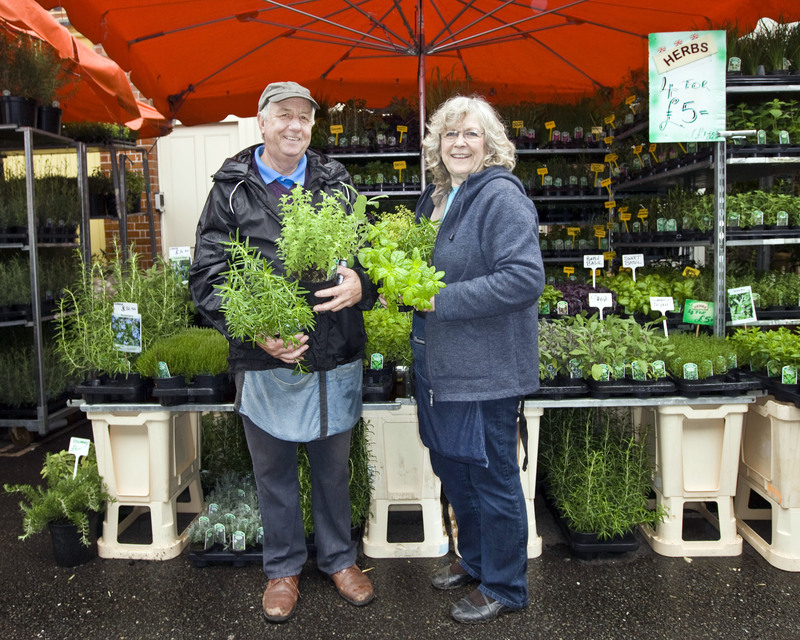 Married forty-nine years ago, they spend all week together tending to the hundred and fifty different herbs they cultivate at their nursery, and every Sunday running the stall.“My family have always been in the flower business, but over the years we’ve specialised in herbs,” explained Mick who began at eight years old, selling flowers in Romford Market with his mother and father. He fills with affection to recall his grandfather, a flowerseller with a horse and cart, who sold ice cream in the Summer months, calling out “Oki poki, a penny a lump, eat it quick or it makes you jump!” Mick & Sylvia set out on their own in the Caledonian Rd Market forty years ago selling flowers and plants. “Although we always had a nursery, we only started this ten years ago,” he revealed, with understated pride for his beloved herb stall that has become an East End landmark as well as the lynchpin of the flower market. Mr and Mrs Grover have a beautiful display. No wonder their business also thrives. It’s going to be fun to meet the other folks who make your (and our) weekend visits to the Columbia Road Market such fun.